The following is a guest post about being a philanthropist. If interested in submitting a guest post, please read my guest posting policy and then contact me. It’s not just about growing your wealth; it’s about giving it away—and making a difference. Have you ever heard “It’s better to give than receive?” Well, we certainly can’t give without receiving. But the purpose of accumulating wealth should be more than winning a rat race or buying bigger toys. Life’s greatest satisfactions can come from giving away—from investing in someone other than ourselves. Do you have to be a devoted philanthropist to be happy? If you want to be a well-known and remarkable one, then yes. But it doesn’t take millions and your face in a magazine to invest in a non-profit. You can start small—even by investing in one homeless person on the street. You may not be aiming to become a billionaire who invests massive wealth in curing AIDS or ridding the world of poverty. Bill Gates is well-known for making a difference with his societal investments. And you can be remembered too—even if it’s by one person or one family. Many readers of Modest Money have an entrepreneurial fervor. Maybe we work a full-time job, but many of us know how to be frugal and grow our wealth to fulfill personal dreams and opportunities. Why not take the same entrepreneurial zeal and philosophy and apply it to making a difference in people’s lives? You don’t have to work full-time as a missionary, in a soup kitchen, or in a lab fighting cancer to do this. Becoming an upstart at anything—a restauranteur, a carpet cleaner, a cabinet maker, even a philanthropist doesn’t take 60 hours a week to start. Don’t feel like you must find the world’s perfect non-profit to invest in upfront. Yes, do your research before giving your hard-earned cash away to non-profits. Look at their overhead and their fundraising expenses. Are they accountable? Are they making a tangible difference? (This is an article in itself that we can’t dive into here). Donate time—this is a great activity to share with you children if you are a parent. Lots of life lessons to instill! Find someone to invest in. The world’s problems sometimes seem much too big to make a dent in. Don’t feel like you need to conquer the world’s problems. Help one person or family conquer theirs. I give water and food to homeless folk all the time. As an experience, I once slept on the street with the homeless on a dewy February night in downtown San Diego. One night was hard. I was so hungry and thirsty the next morning. I can’t imagine having the energy to go get water, food, a shower, clean clothes, and then try to find a job. It’s tough. So a handout of food helps these folks out. What’s one step better? Helping the same person over and over. If you can help one man, woman or child emerge from poverty—or other dire straits—do it. It’s not complicated. If on your routine drive you see the same person asking for food each day, get to know them at lunch sometime. If they have some vision to get out of their situation (and I’m positive they will), encourage them and give them some consistent help. Small steps make a difference. Maybe it’s not a homeless person you help, maybe it’s a person at the office who’s beset by tough times or a death in the family. If you want to take your upstart philanthropy to the next level of making a difference, consider committing a set amount of time to help a non-profit. Find one that you can be passionate about, and volunteer. Every financially minded person knows they must research before making an investment that they expect to pay off. It’s no difference with philanthropic work. Companies can do a lot of the leg-work for you when researching who to invest in. Whether it’s creating a lasting gift to help individuals and families, helping your own clients or staff give, understanding charities and non-profits, these companies can help you maximize and feel secure about your philanthropic gifts making a difference. Don’t worry, we all know none of us have all of life figured out. But as we are working to grow our money modestly, let’s figure out how we can help people along their journey. Even if no one notices, you’ll know that you made a difference. Volunteering is a great way to further a cause, support an organization, and make a difference in your community. It can also be an opportunity to meet new people and learn new skills. If you’d like to give something besides money, consider lending your time and talents to organizations that are important to you. I absolutely agree. Investing yourself into an organization can be much more fruitful than your finances. Starting small is a good way to begin our philanthropic works and just give what we can afford. Small giving is the right place to start. Just like investing, you need to learn the ropes and what organization you really want to give to. There are some places where you can get fined for giving homeless people food! Right now, all I can give is my time. I volunteer at a local animal shelter and will soon start being a wish granter for Make-A-Wish. I imagine that will be a very rewarding experience and I can’t wait to get started! Really? Wow. I haven’t heard of that–where does that happen? I know there can be some amount of liability b/c you don’t want to give someone food that makes them sick. I have yet to hear about being fined for it though!! Oh man that’s so sad. I clicked through the links in the article you attached and it’s real. Wow, even in Dallas and Houston, I’m very surprised. I would like to hear the specific, in-depth reasoning for it, not just soundbites from critical websites. What’s interesting is the people most complaining about it are religious groups. Great post! I definitely think that it is better to give than to receive. It sometimes much more rewarding to be the giver. That was an excellent quote from Cloud Atlas (I’ll have to check the movie out). Thanks Andrew! I agree. As for Cloud Atlas, I thought it was a great film. But something they do with the actors is a bit hard to understand. I had to Google it after the fact for it to all make sense. Aside from that, it’s excellent and a lot to think about. What I find the most inspirational is that you don’t have to be particularly rich or even talented to make a real difference when volunteering or doing charity work. I agree. 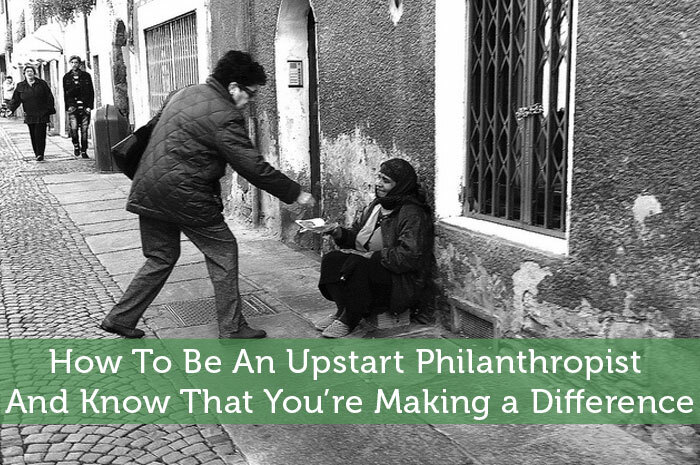 Anyone can be an “Upstart” philanthropist! As someone who works in non-profit fundraising, I know from experience that you can write on your check that the donation is to go to a specific cause-therefore forbidding your donation from going to overhead support costs. (Yes, charities do get audited yearly and they must abide by these declarations). While we don’t necessarily love this as this means your donation can’t go to our own salaries, I do recommend this especially for when you’re donating to a relief effort. Big charities use so much of their funding for overhead that it is unsettling how much of say, that $10 donation you made to the Red Cross after Hurricane Sandy, actually went to Sandy relief. and PLEASE DON’T text your donation. Most charities get a tiny percentage of text to give operations! And if you really want your donation to go far, write a check and mail it in. Credit card fees cost charities on average 3-5% of your donation. I know we all love credit card rewards, but cash/check are king in fundraising. And to save even more costs, say “no acknowledgement needed” (if you don’t need a tax receipt) to save the charity on paper and mailing costs. Wow this is really all good advice for me to include the next time I write on the subject (which will be soon!). Mailing a check is wise. As for the specified donation, I think that’s a great point as well. Some non-profits spend an exorbitant amount just to court donors. I know that for some it is a part of the process, but I would rather see staff at non-profits get compensated at a better rate. I worked in the non-profit world for 8 years as well. Our president, during a time of fiscal crisis, actually called some large-scale donors and personally requested that they “release” a donation for a specific cause to be used for general funds just to make ends meet. Fortunately, he only had to do that a couple times. But it’s nice to know he had the integrity to do so, and that level of commitment by the donors certainly brought accountibility. I believe giving is built into our nature and everyone can do a little bit to help others. There are many personal rewards that are received when we give of ourselves. I absolutely agree. I just checked out your site. Will definitely keep an eye on it! Everyone I believe can and should help others. The key is start small and just do more as you can. We were giving to charities at one point but realize that money can easily be spent on things that we did not intend for it to go towards. We started devoting our time instead. I like what Tara mentioned about putting where the money needed to go on the check. Never knew you could do that. That’s a hard balance to strike. Charities do need finances to operate. A great volunteer who’s committed beyond just an hour or two a month can be a great addition. But someone that comes and goes as they please who doesn’t make a solid “investment” can sometimes be an obstruction that non-profits are fearful to turn away. Volunteering is a great way to help out but even bloggers are making a difference in the lives of their readers every single day. I have a feature every Saturday on my blog called Making A Difference. There are so many ways, even small ones that can make a huge impact on someone’s life. CBB–That’s a great thought! I do think most of the blogging community, especially PF blogs, really do want to help people out and add to people’s lives! I love your point on one person at a time. Just started sponsoring kids in my village to pursue further education and it is great to see a project, albeit small, taking place before your eyes. That’s awesome Pauline! It really is about individuals! I like your idea of just starting small and building from there. This is something I need to work more on going forward. Thanks for the inspiration!